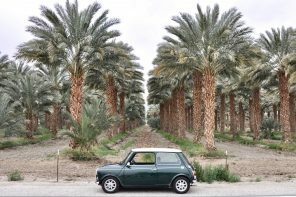 We just recently became a two-MINI family (actually an all-MINI family), so that put me in a special position to compare the first and second generation MINI Coopers side by side. They’re both daily drivers, neither will see a rally or a track. Just spirited in-town and highway driving. 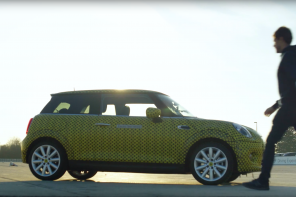 Her’s is a 2004 MINI Cooper (R50), CVT transmission, in Solid Gold and black top. It sports the Premium and Sport packages. Cordoba beige “soft” leather interior, HK HiFi, sport suspension, performance runflats on 16″ 5-stars and some other options. 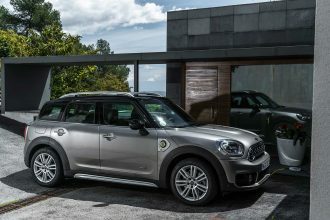 Mine is a 2007 Mini Cooper S (R56), Dark Silver with black top. 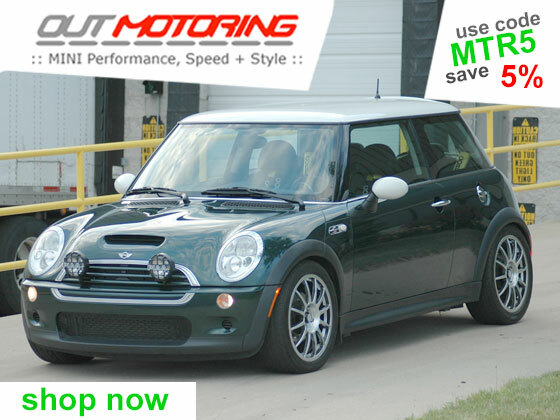 It’s equipped with the Premium, Convenience, and Sport packages, Lounge leather interior, HiFi, LSD, sport suspension, and performance runflats on 17″ web spokes, and some other options. The driving lights on mine have yet to be fitted, and I didn’t get a chance to wash it before I took these photos. I’m just lazy that way. For all pictures taken shown here and a few more (all shots taken for comparison, not artistic value), please visit my SmugMug gallery. I realize this is an apples-to-oranges comparison. Yes, it would have been a fairer comparsion if her car was an MCS, or even a manual and not a CVT. I realize the MC here is a pre-refresh 2004 as well. And although I’ve driven a 1st generation MCS, I’m not going to try making that apples-to-apples comparison. However, I believe much of the comparison is valid. 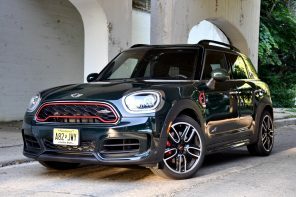 After all, the R56 isn’t really getting complaints about performance relative to the 1st generation MCS so much as the styling differences and allegations of a “softer” ride. My goal here is not to detail the differences, but to highlight a few of them and share our overall impressions based on driving both cars. 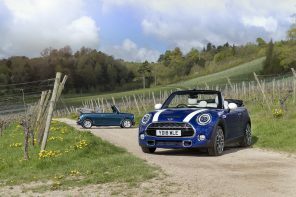 In the photo above, you can clearly see the major styling differences between the generations. The 2007 looks larger overall, but has the same stance and aspect. 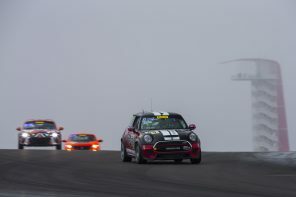 As this is a pre-2005 Cooper, it doesn’t have the refreshed front-end, and if it was an S with the aero kit, the differences would still be significant, but not as stark. Do a Google image search if you don’t believe me. In the photo below, you can see that I got the white turn signals on the R56. But in the photo above, why do they look orange? Well, the bulb inside is orange of course, and head-on, the front turn signals do look orange, because there aren’t as many diffractive surfaces on the lens as there are on the rear so the front lights look more orange as you move towards the front. Off-axis, it’s easier to see it’s an orange bulb and a clear lens. In my opinion, the changes to the rear of the car are less strking than the front. Moving the back-up lights to the tail-light cluster is a good thing, as the R50’s backup light is nearly useless for illumination. 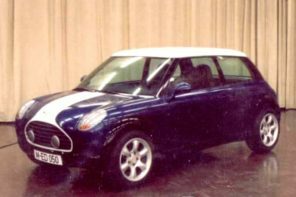 The 2005-2006 MINIs do have the backup lights in the cluster, and I can’t compare the difference in illumination, but the difference with the two cars above is significant. Still, the output is rather low and I’m glad I opted for the parking distance control on the new car. Another item you can see in the rear-shot above is that the side mirrors are a different shape. 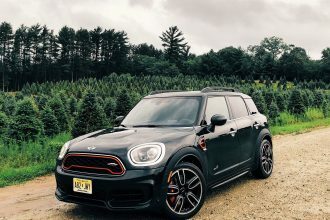 They measure to be the same width, but the R56 has oblong (sort of rounded-triangluar) mirrors that measure a half-inch higher at their thickest point. 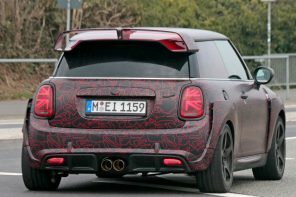 I think there may actually be a tad more ground clearance on the R56, maybe a half-inch to an inch depending on where you measure. The front air dam complicates that as well. It’s clear though that the new car’s belt line sits about a full inch higher, compressing the window space a bit, as the height (as reported elsewhere) is nearly the same. The visual effect is stronger here because the MC has window tint and the MCS doesn’t yet. 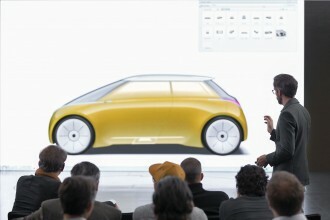 Nevertheless, as others have reported, the MINI designers did a great job keeping the overall proportions consistent. So is it bigger? Yes. Is it huge? 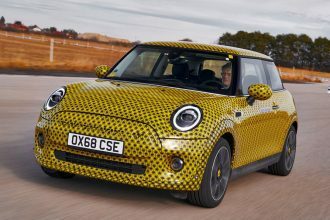 Is it the over-bloating of the MINI Cooper? Hardly. The numbers don’t lie — the car is only marginally larger. It all adds up though to the perception of a larger, and more substantial car. 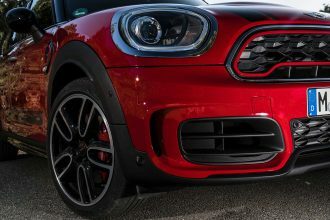 Much has been said about the R56’s “snout” as well. 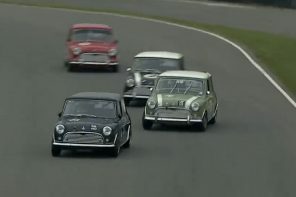 Here we have something of an extreme comparison, because the hood on the R50 Cooper is lower than the hood on the supercharged R53 Cooper S, but this gives a good “before and after” comparison. Taken individually, each car looks balanced and properly proportioned. It’s only when you see them together that the differences become obvious. 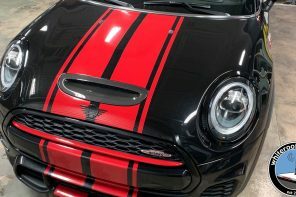 Looking at the picture above, I almost think the R56 would look more in line with the R50 if they’d stretched the hood a tad, maybe by about another inch, but then the car would look even bigger. Above you can also see the differences in the wheel well trim, which measures a half-inch thicker on the R56. 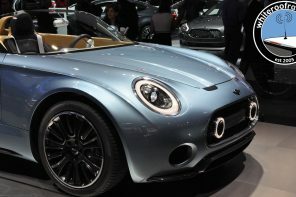 (4 inches vs 3.5 inches) I believe if they’d shaved that down on the R56, the R56 would look even larger. There are so many photos of the new and old interior on the web already, that I thought it would be a waste of time to chronicle every little difference. However there are a few details that I think are worth pointing out that aren’t as obvious in the photos I’ve seen. In the photgraphs below, the R50 Cooper is on the left, the R56 Cooper S is on the right. Boot volume has increased a hair, in part due to the loss of this bulky bit. You can also see that the latches to fold down the seats have moved to the opposite side. The boot hinges are different, and the tubing holding the electrical wiring is on the other side. However, the door itself looks pretty much the same. The stalk controls for turn signals and wipers are no longer “bent”, they’re straight. But from the driver’s perspective, they’re in the same place. The action (ignoring the different way the turn signals work — you can read about that elsewhere) is slightly different though, as the levers pivot on a different axis. Note that the button for the onboard computer is no longer on the top, where you can accidentally hit it, but on the end. 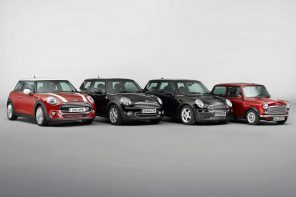 There have been claims that the R56 is quieter than the previous generation. 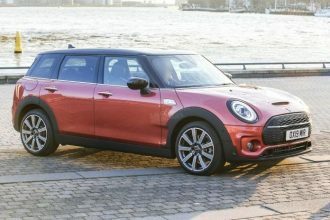 This may be true when comparing the R56 MCS to the 1st gen MINI Cooper S (R53), but the sound levels are comparable when comparing these two cars. I used a SPL meter to measure the levels on the outside and the inside of both cars (A-weighted, for measurement geeks). Ambient noise wouldn’t measure on my meter, which bottoms out at 50 dB. So is it quieter? Maybe than the 1st gen MCS as there’s no supercharger whine, but overall, it’s about the same, maybe even louder inside the 2nd gen at least at idle. We also observed that the sound of the door lock on the R56 is a lower pitch than the sound of the door lock on the R50, but the sound is the same. Both cars have the sport suspension, so this is a relatively fair comparison. 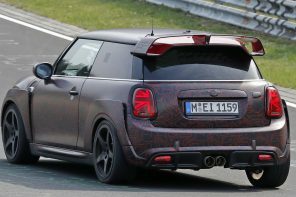 The R56 is supposedly tuned for runflats though, and sports the 2nd gen runflat technology that supposedly gives a smoother ride. Our verdict? The ride is the same. I perceive a slight bit more of a jarring ride on some surfaces on the R50, but it’s subtle. If we had 17″ rims on the R50, it might be more of a difference. 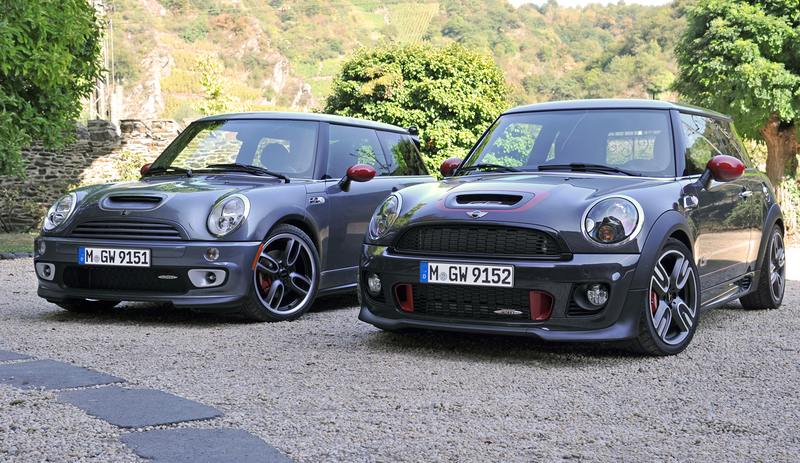 Both cars handle similarly, and I’ve driven the R56 with the sport mode on and off. I do agree with reports that the 1st gen is a bit more “tossable”, and that the 2nd gen has a bit more of a disconnected feel. It still goes where you point it, especially with the sport mode engaged, but there’s a bit less feedback through the steering wheel, which contributes to the driver feeling like it’s riding a bit softer. I believe that’s where most of the “softer ride” perceptions are coming from. 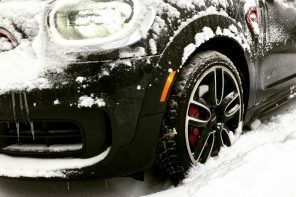 The steering on the R56 also feels heavier, more weighted. This is a feel I prefer. Some will prefer a lighter, twitchier wheel, but I like the solid feel. This does contribute to the sense that the car is heavier and less tossable than the previous generation, though. Transmissions? I can’t compare the CVT to the Getrag 6-speed at all, even in the M/S position. It’s beyond apples and oranges there, we’re into apples and zucchini. Driving the CVT aggressively is a struggle. The engine wants to go, the CVT isn’t so sure. In comparing the ride, we also thought the seats might be making a difference. The seats on the R50 are the Gravity Leather sport seats, which to my rear-end, feel harder and more fatiguing than the Lounge Leather sport seats. The differences in the sunroof operation and screen have been the subject of some discussion online. 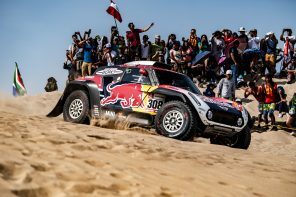 The operation on the R50 is superior. The screen on the R50 is spring-loaded, which is much nicer but the screen in the R56 is in a frame, so that the sides are not floppy. Of all the differences between the cars, the sunroof screen is the one thing that my wife found genuinely annoying. The new screen design just feels cheap. They both have a light gap at the front when the roof is completely open, but you don’t notice it on the R50, because it has a hard-plastic deflector that pops up when you open the roof. The R56 has a mesh screen deflector that of course doesn’t block light. Wind noise on both was comparable, although some report that the closed-position on the R56 has unacceptable levels of wind noise. I believe this to be a fitting problem, as not all are reporting this, and I’m getting zero noise while closed. It’s similar to the panel gaps that have been reported on the bonnet. My R56 has very tight gaps. Shoulder room is the same in both cars. We ride elbow-to-elbow. 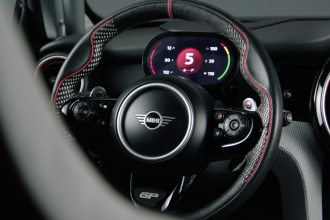 My wife preferred the steering wheel cover on the R56 to the R50. Acceleration on the MCS is superior to the MC. That’s not news, but this is the first MCS my wife has driven, and she made several positive exclamations while driving it. 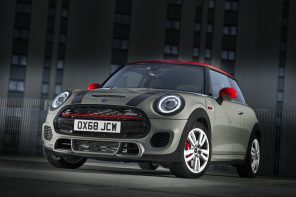 I also can’t really compare torque steer on these cars, because frankly there’s much less low-end torque on the R50 Cooper, and the CVT is in there spoiling the party. That being said, in spirited street driving, I find the torque steer to be acceptable. 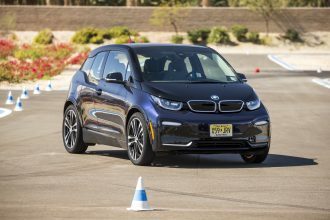 That is, no more or less than I expect from a powerful front-wheel-drive car. The hood (OK, OK, I’ll comply with MINI marketing directive #2 — it’s a “bonnet”) doesn’t feel as flimsy as some people have said. Comparing the two, the R50 bonnet does feel sturdier, because it’s heavier due to the lights being mounted in the hood. The allegations that it’s like tin foil are greatly exaggerated. If you removed the lights from the Cooper, I believe the feel would be the same. Panel gaps between the bonnet and body — on my car they’re fine. They look like any other two body panels meeting, nice and tight. Both cars really could use auto-up on the driver’s side window. 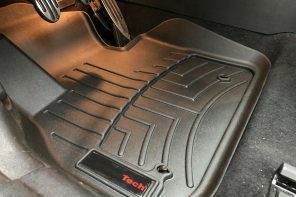 This is more of a lack with a manual transmission than an automatic. You can’t speed away from the toll booth and roll up the window at the same time. Overall, we really like both cars. The R50’s clear weak spot is the CVT, which is remedied in later years when the CVT was dropped. Even with its lower power, it’s a blast to drive. 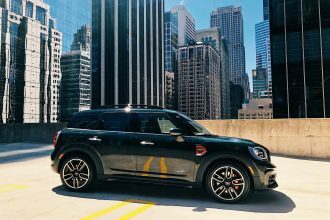 The R56’s weak spots (if you consider the car by itself and not in comparison) are in the details, and ironically, its refinement. The cheap-feeling sunroof screen, the little annoying things like the speedometer that’s just a little too big, the radio that you have to read a manual to even turn on the first time, the genuinely goofy aesthetics of the center control stack under the speedometer, and a few more little details like that end up being the R56’s biggest problems. That’s a good place for a car to be. 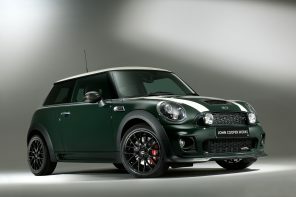 It’s clear the R56 is a bit more refined and more BMW-like than the Rover-initiated 1st gen “new MINI”. There’s no Rover left. 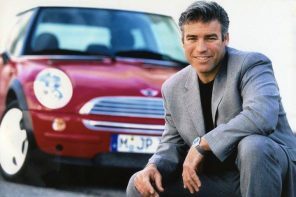 For those that relished in the rough edges of the R50 and R53, that’s a loss. For them, the new car will feel a bit more sterile. I don’t think that will be the general impression. 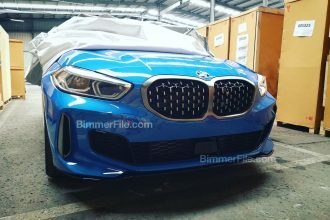 If people want to say that means BMW is appealing to the masses, that’s fine. It’s a very good car. The loss of the easy mods to the supercharger, and the lack of aftermarket performance parts for the new car due to the redesign that changed everything just enough (even the stubby antennas don’t fit! 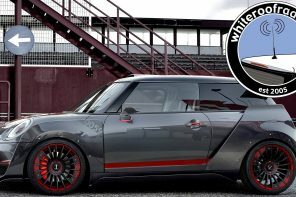 ), means that enthusiasts who plan on extensive mods probably should stay with the 1st gen platform for now, as there’s a ready supply of parts, and very few for the R56. I don’t think that situation will last very long, though, and I don’t think it will hurt sales at all. 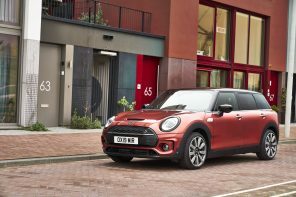 The vast majority of MINIs see some customization, but the demand for aftermarket parts is not driven by the vast majority of buyers. I can’t see any changes I’d classify as “blatant cost-cutting measures by BMW”, except for two: the sunroof screen and the missing wrap-around glass on the rear. The R50’s wrap-around glass is a nice touch, but it’s a small one. Otherwise, if the manufacture of the car is less expensive, that’s fine, but I’m not left with the impression that corners have been cut, making the car “cheaper” in feel or performance. 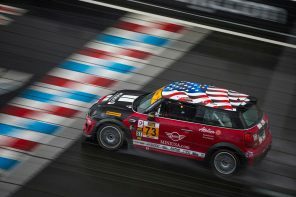 The MINI is still the best-looking and most fun car in its class.